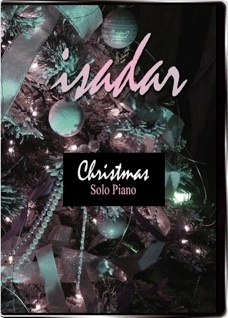 Christmas: Solo Piano is the fourth and final installment (for now) in a new series of DVDs Isadar has compiled with performance videos and music videos of selections from his six (so far) solo piano albums. Most of the music on this DVD comes from his 1999 release, In Search For the Meaning of Christmas, but he also included “Song of the Wise Men” from his upcoming O, Christmas, and “Snow” from The Purple Heart. Four of the eight selections are music videos, three of which are mostly colorful and sparkling images of opulent rotating Christmas trees. There are also images of stained glass windows, snow, and other symbols of the Christmas season. 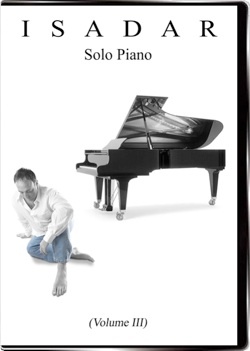 The fourth video, “Snow” also appeared on Isadar: Solo Piano, Vol. 3, and shows beautiful footage of snow in the trees and what looks like a park in winter. Alternating with the music videos are four performance videos showing Isadar playing “Bring a Torch,” “Song of the Wise Men,” “Greensleeves (homage to Liz Story),” and “Star of Wonder (We Three Kings).” The performance videos were filmed from five different angles, giving various views of Isadar’s hands and face as he plays. There are also montages of overlapping videos that are fascinating to watch and that should be a huge help to pianists who are learning to play Isadar’s sheet music. This DVD will be a treasured addition to collections of Christmas music and videos for years to come, and is currently available only from isadar.com. Recommended!